D.I.Y. 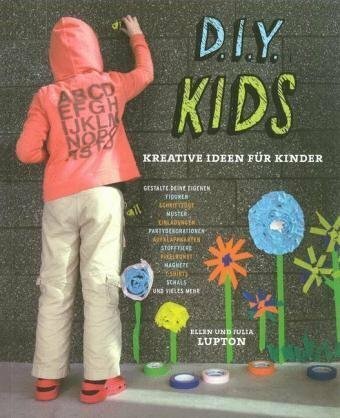 Kids encourages young readers to use basic design principles and on-hand materials to express their individuality through more than eighty imaginative projects. The book is divided into four sectionsa Graphics, Toys, Home, and Fashiona each packed with ideas for making fun and useful items, including step-by-step instructions and colorful photographs of cool designs and the kids who made them. D.I.Y. Kids is designed to trigger imaginative play, ita (TM)s for parents, teachers, aunts and uncles, friends and babysitters, neighbors and citizensa anyone who wants to create a better world not only for, but also with, the next generation. Ellen Lupton is a curator of contemporary design at the Cooper-Hewitt, National Design Museum and the director of the graphic design MFA program at the Maryland Institute College of Art. She is the author of numerous books, including D.I.Y. Design It Yourself and Thinking with Type. She received a Gold Medal for Lifetime Achievement from the AIGA in 2007.